growing, learning and changing: Teachings from Beth Moore! Wouldn't you know that Beth Moore would go to Lincoln when I didn't live there anymore! But oh well! I did know several of my friends went and I'm sure that they were so blessed. But for those of us who didn't get to go, here are some notes from her teaching that weekend, that I borrowed from here. There is a "better" that is "bitter." And there is a "better" that is "better." If you're like me, you've probably never thought of it that way. I tend to think that better is better is better is better. But Beth pointed out four different ways that better is actually bitter, then contrasted those points with five ways that better is better. Stay with me. It gets really good. I'm going to share all four "better is bitter" points today - and then I'm going to come back in a few days and elaborate on point number two. Because point number two? It read my mail. 1. Better is bitter when better is before (Exodus 14:12, Numbers 11:14, Numbers 14:3-4). This mentality creeps in when we decide that our best days are behind us. We think that job was better. Or that man was better. Or that time was better. We can't go forward because we keep looking back over our shoulders. Beth illustrated this point by examining the Israelites in Exodus 14: "it would have been better for us to serve the Egyptians than to die in the wilderness" (verse 12). If we're not careful, we stay trapped in the mentality of the past, failing to recognize that God has delivered us to a far better place. 2. Better is bitter when better is someone besides me (Esther 1:19, Galatians 5:25-26). We're going to constantly run into people who are better at whatever it is that we want to be good at, and we're threatened by that. We decide that so-and-so is better at parenting / parallel parking / leading Bible study / cooking / life-in-general, and bitterness takes root. It's like I heard Melanie say one time: we look at the blessings in another person's life and decide that it somehow takes away from what God is going to do in our lives. Beth used Philippians 2:7 to show that we need to empty ourselves of our vain conceit because it is EMPTY GLORY. 3. Better is bitter when better is the route I didn't take (Ecclesiastes, 1 Kings 19, Jonah). Some of us are living in constant regret, and our woe is me attitudes are killing us. Beth used the examples of Solomon, Elijah and Jonah to show how those regrets can affect us if we're not mindful to squelch them. Just because there have been disappointments in your life, you are not better off dead (see Jonah 4:8). Beth mentioned that if you really were better off dead, God would have already taken you home! 4. Better is bitter when better is what you should have known (Romans 7:24-8:3, Hebrews 12:18-24, 2 Corinthians 7:10). Sometimes we go one step further with regret (point #3) and move into "I should have known better, but..." or "I DID know better, but...." Beth spent a lot of time on this point, and the bottom line is that WE'VE GOT TO MOVE ON. We can't self-loathe for the rest of our lives. To be in the trap of "I knew better" is a body of death to us. At some point we have to decide if we're going to stand in front of Mt. Sinai or Mt. Zion. If there's a place in your life where you should have known better or did know better, God knows that you regret it. He knows. So let's move on from that thing. Psalm 30:5 says "For his anger lasts only a moment, but his favor lasts a lifetime," but we live like the the opposite is true. We're standing in front of Mt. Sinai when we need to move it on over to Mt. Zion. Don't you wish you had been there??? I do! 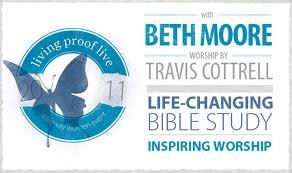 But looking forward to Beth's Living Proof Live in September!! !